Meal 1 (not shown): Oatmeal with scoop of protein powder or Shakeology. Meal 2: One egg, three egg whites, and half a cup sweet potato. Meal 3 (Mon/Wed/Fri): Grilled chicken and cucumber, bell pepper salad. Meal 3 (Tues/Thur): Ground turkey with taco seasoning, sautéed asparagus, mushrooms, carrots, and onions. Meal 4: Grilled trout, sautéed kale, and blueberries and raspberries. Meal 5 (not shown): Usually chicken sausage, salmon, turkey burgers, or chicken with veggies. 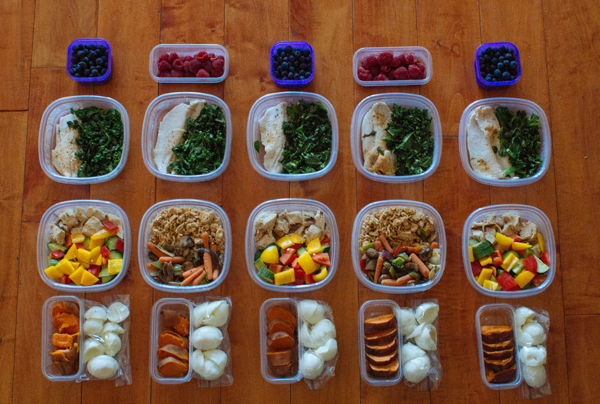 Meal Prep Mondays are HERE!